Every year, thousands of people purchase and operate jet skis, sea-dos, wave runners, and other personal watercraft. This is especially true in Florida and other coastal states where boating is a popular recreational activity. Unfortunately, this often results in operators, passengers, and other third parties being injured. Sometimes, the injuries are the result of negligence on the part of the vessel’s operator. Other times, an operator of another vessel may be the cause of the injury, or the manufacturer or designer of the personal watercraft may be strictly liable for the injury because the watercraft they designed or sold is defective, and unreasonably dangerous. 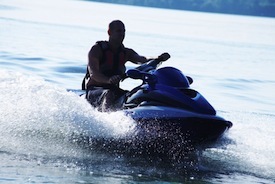 Cases involving personal watercraft, such as jet skis, sea-dos, and wave runners are typically governed by maritime law. Because these accidents often involve a defect in the vessel itself, they frequently require an understanding of how the watercraft is designed and marketed, and what safeguards the manufacturers of the vessels have taken to prevent certain injuries from occurring. This is particularly true where the accident is the result, in whole or in part, of the manufacturer or distributor of the personal watercraft designing or manufacturing a defective and inherently dangerous product. The accident may, for instance, be caused by a defect in the watercraft’s off throttle steering mechanism, or the jet nozzle, which can result in catastrophic injuries to the brain, spine, or other internal organs. The manufacturer may also have failed to adequately warn passengers or operators of certain dangers involved in the use or operation of the personal watercraft, or have placed the warnings in such a manner as to be ineffective. Such cases normally require retaining expert witnesses with a knowledge of personal watercraft, such as marine engineers, marine safety, and human factors experts. It is also important to know whether the manufacturer of the particular watercraft involved in the accident had knowledge of prior similar accidents, and what steps, if any, they took to prevent or guard against them. Recently, our Miami firm was instrumental in helping to obtain a $3 million verdict against Kawasaki Heavy Industries on behalf of a passenger who was severely injured when she fell off the back of a jet ski and sustained injuries to her body cavities and internal organs. David H. Pollack has nearly 20 years of experience handling maritime cases on both the trial and appellate levels, including accidents involving recreational boats and personal watercraft. If you have been injured in an accident involving a jet ski, sea-do, or other personal watercraft, it is important that you consult an attorney who has knowledge and experience in maritime law and accidents involving vessels or personal watercraft. Call or e-mail us to schedule a free consultation to discuss your case.